Dan Sweeney, Player of the Year - a fantastic achievement after only 25 games. 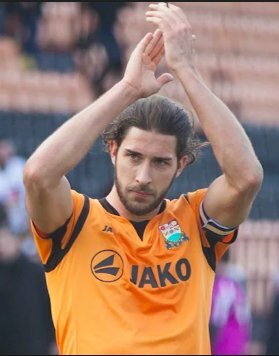 Dan Sweeney has been voted the 2017-18 Barnet Football Club Player of the Season. He joins a very exclusive club. Dan signed for the club in December 2016 and took a while to establish himself in the first team after various loan spells. Graham Westley saw his potential in central defence and indeed his leadership credentials. He was made club Captain and under Martin Allen he began to shine in a midfield role. In a very short space of time – just 25 first team appearances - he has endeared himself to the supporters so must take immense credit for getting the award. Dan was born in Kingston upon Thames in 1994 and was youth player at AFC Wimbledon. From March 2013 he joined AFC's ground tenants Kingstonian and was offered a trial with Ipswich Town. He then spent a couple of months at Dulwich Hamlet before a move to National League South Maidstone United. An undisclosed fee bought him to the Hive. Dan has made one England C appearance against Slovakia in June 2016. Up until recently the Player of the Year had been organised by the Supporters Association and this prestigious award was first presented way back in 1970. Les Eason, was the first winner – not only because it was his finest season of the ten he spent at Underhill, or his faultless performances every week, or that he was every fans favourite, but there was the small matter of 41 goals too! In the early 1970's defenders seemed to come out on top with Gordon Ferry picking up two awards. Gordon could play at centre half, in midfield and also as a striker and briefly took over as Player Manager in 1974. John Fairbrother's 35 goals in 1976 heralded the arrival of Jimmy Greaves the following season. Jimmy was simply magnificent and head and shoulders above any other player in the Southern League even at the age of 36. It is a widely quoted fact that even operating from midfield he was the Bees top scorer in 1977-78. Goalkeeping legend Gary Phillips won the first of his three awards in 1982, which was equalled by Lee Harrison, who is the only player to have won 3 successive awards in 1998, 1999 and 2000. Other goalkeepers to have won are Jack McClelland, Steve Humphries (twice), Maik Taylor, Jake Cole and Jamie Stephens. David Stephens (in 2013 and 2104) and Giuliano Grazioli (in 2004 and 2005) have picked up successive wins, while Joe Devera also has two trophies on this mantelpiece from 2008 and 2010 as has John Akinde in 2015 and 2017. The complete list is below and many of these players are part of the DNA of our club but it is not a definitive Who's Who by any means. Please note that some serious Barnet Football Club A list players have never received the award. In the old days the Supporters Association threw a party at the end of the season and most of the players attended. It really was a very special occasion and was always a fun-filled night full of incident. The events back in the 1980's were especially legendary and stories from them are probably best kept for a drink in the Bar! I once woke up on the West Bank Terrace early one Sunday morning after a PotY having missed the last train back to Finchley! After one particularly poor season, long time supporter Gary Mills, the Compare, announced that instead of a Goal of the Season the SA have voted for the best Corner Kick of the Season – a few of the players saw the funny side of it but a few certainly didn't and it got rather “colourful” for a while. Unfortunately for various reasons the award ceremony is a very low key affair if put on these days, since we arrived at the Hive at least – but as an old timer I would like to keep the tradition of the award alive. We all of course have our opinions as to who and why should win every season but I feel it is still an honour that should be embraced by any player fortunate enough to receive it. Well done Dan, I do hope you win it again next year and have to juggle it with another trophy!